In case you were worried (you shouldn’t have been), I fixed my sewing machine and cranked out that pillow case. 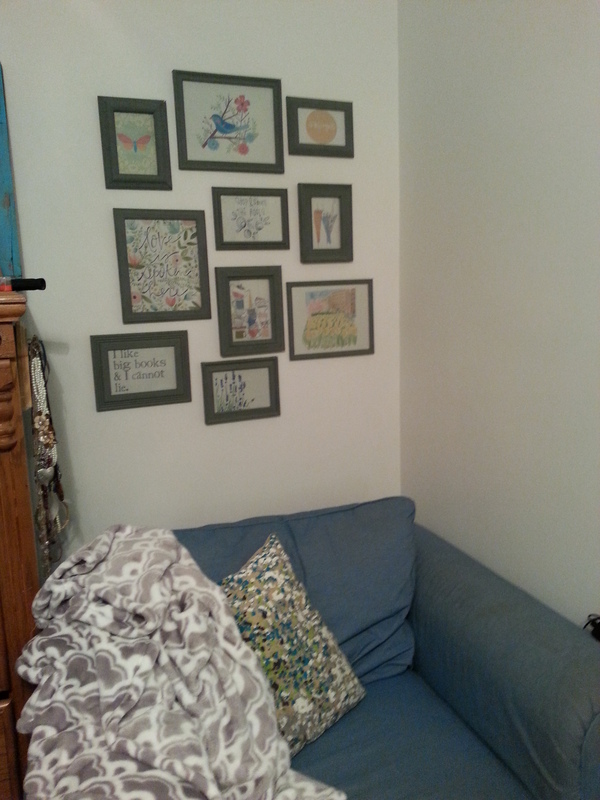 I finally put holes in the wall and finished that photo gallery! Pillow Case #2! 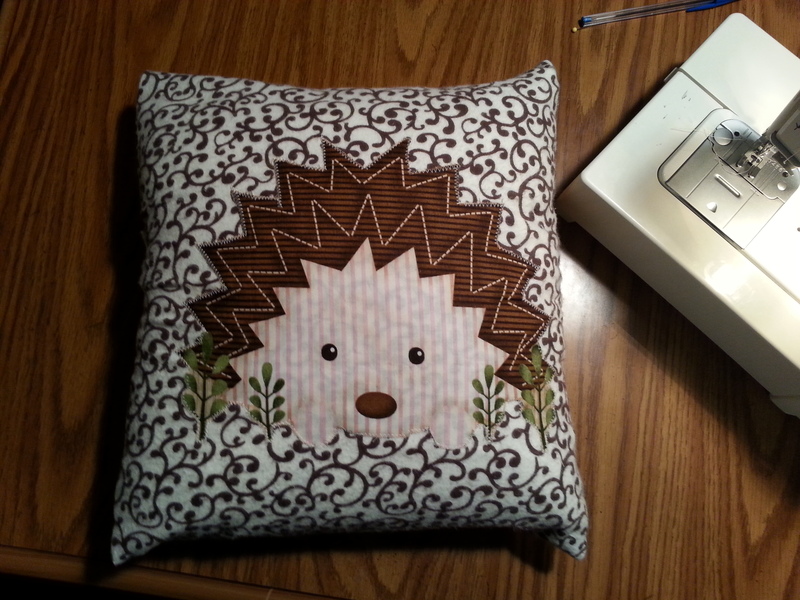 Hedgehog attached with super fancy stitching by my sewing machine and mad skilz. The coziest corner of our bedroom. Belinda (the chair) and my photo collage (pictures found on my Pinterest board!). Can I just say (again) how thankful I am for a husband that is so supportive of my hobbies? I love the way he encourages me to develop skills, especially when it’s blessing someone else. However, I must admit that now that I have so confidently taken on a new project, I am back in the stage of doubting myself. I didn’t know what I was doing last time, and I think the end result was pretty darn cute… so this will be ok. I have been totally persuaded by the cuteness of baby things for boys… there’s definitely less options, but I’m just in love with the fabric I found. Tomorrow is nerd night, and I didn’t have plans… well now I do! I’m having a girls night, which means Mexican food. I’m really looking forward to it, especially since I haven’t spent a lot of time with them since Aaron moved in… which is fine because I didn’t have the emotional capacity to. Today, I feel stuck waiting. For the mail, for help in the office, for 5 o’clock. I am praying for joy in my job today, because it’s not that bad. NONE OF THE PROBLEMS AT WORK ARE THE END OF THE WORLD. (Yes, caps were necessary.) But, in two hours I am running out the front door, and going home to my husband. We are splitting our meals tonight, so we both get steak and chicken. I will continue waiting for the work day to come to an end, and praying for my attitude in the meantime. I will think about the happy things I’m anticipating like holding Joseph in just 2 weeks, making ham and cheese chowder this weekend, stitching together a blanket that will keep little Miles cozy and warm, and looking forward to babysitting for my friends next Friday while they enjoy a date night. Why do I enjoy making things for my friends? It takes my thoughts off of me… and I need that. I get SO sick of myself, and it is so humbling, and so refreshing, to pray for my friends as I make things for them. I am so excited about our date: sharing food, and shopping for fabric. I love that you encourage my projects, and don’t suggest that there are better ways to spend my time. Today has been frustrating, mostly because I’m learning new things and I feel like a bumbling fool. Thankfully you found a way to get us salad, and steak, AND cheesecake tonight. You… I just love you. I love that your response to my photo collage project was that you loved it and loved that such a strong representation of me was on our wall. That made me feel a LOT better about putting up such girly pictures in our room. Thank you for loving every single creative part of me. I can learn much from you in this aspect. Until 5, I’ll be crunching some numbers, waiting for answers, and balancing ye ol’ Quickbooks… but at 5:30, when I get home we’re on a date. Can’t wait to see you.